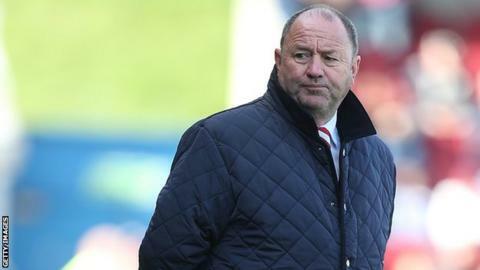 Cheltenham manager Gary Johnson has admitted the transfer window turns him into an "ogre" and his wife "deserves a medal" for putting up with him. Johnson has been a manager for nearly 30 years and says January is the most stressful month of the year. "My wife swears in January she is going to go away for a month as she says I change," said Johnson. "It's so true, the transfer window does make an ogre of you. You are definitely not the same person." Johnson began his management career in 1986, taking charge of Newmarket Town. He has gone on to manager Cambridge United, Kettering, Yeovil Town, Bristol City, Peterborough United, Northampton Town and took over at Cheltenham in 2015. "I'm all nice and polite with you in front of the cameras, but I'm a horrible, raging bull away from them because you are taking calls, your mind is somewhere else," he said. "'I can't do the washing up, darling, I can't make the bed, I've got a centre-half on my mind'. She deserves a medal, more accolades than me because these wives of managers put up with a lot."